Who Crushed On Adam Lambert on The Late Late Show? You are here: Home / Adam in the Media / Who Crushed On Adam Lambert on The Late Late Show? Adam Lambert was back from Florida and jumped onto a west coast stage, performing twice last night on The Late Late Show with James Corden. The show was pulling off its astounding(!) 50th episode, and the host was in full swing comedy mode for the event. 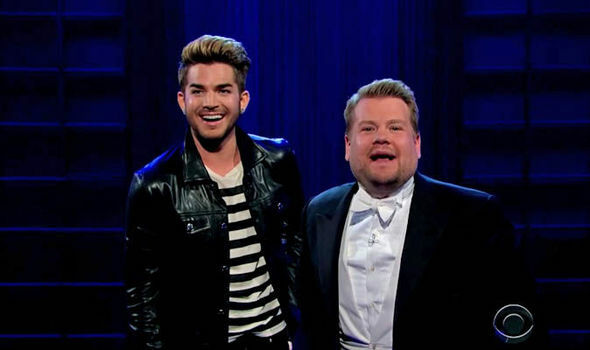 Adam joined in the fun doing a parody salute to Corden using Queen’s We Are The Champions early in the episode. Adam returned later to sing Ghost Town. He was in magnificent form and gave a stylized delivery full of nuances, proving why the industry has so much respect and admiration for him. Also on the show were James Wolk from Zoo and Sir Ian McKellen, who seems to have a crush on Adam! Catch the remark at the end of this segment. Ian kept mentioning Adam, raving about his hair later in the hour. All of this is in good fun, as we get ready for Adam’s highly sought-after concert Saturday night at Morongo Casino. Fans have reported only 100 tickets were released for pre- and regular sales, with the rest being held for radio contest winners. Lord knows my good girlfriend Glenda & I tried at every opportunity from Los Angeles’ MyFM 104.3’s week-long contest. Almost every time we were 1 of the 20, but never #20 – the magic winning caller number. What this means is the small venue will be filled potentially with radio-contest fans, not necessarily Adam’s fans. But he can turn them into fans, right? All the better for Adam’s rising career. I’ll have a story posted following the concert. I’ve seen Sir Ian McKellen in movies but I never really knew much about him. When the words “Where’s Adam? ?” came out of his mouth, I laughed so hard I almost fell over. It just got better from there. Ian is a trip! My redditor son told me that Ian and Patrick Stewart are really good friends and that they’re hilarious together. (He must have seen videos on reddit and or youtube.) Adam’s performances were fantastic. Between his singing and the laughing, I enjoyed the show so much! I watched the whole show and I thought it was great. I watch Zoo so that was interesting but of course ADAM was the whole show, from beginning to the end. I never heard of Sir Ian McKellen but saw that he was very attracted to our beloved ADAM. Loved the whole thing by Adam….his singing and his humor. He is just terrific again. We were lucky enough to be in the audience! Sir Ian was DEFINITELY crushing on Adam! So much so, that before he left the set, Sir Ian literally ran to Adam and hugged him! So freaking cute! The concert at Morongo was… well, freaking amazing. As I type, we are on our way to The Talk taping to see him for the third time in four days. So happy! I always love anything Adam sings. He has such a great voice. I found this new album to be kind of dark? Maybe it is just me. A bit depressed the last few days. Adam like I said has a great voice. This album is just a bit different. It is nice to hear him go in a different direction. I hope this is just wanting to change up a bit Adam! I hope you are not having any problems of any kind. I mean everyone can have them. Love you baby. Keep up your super songs. Really when it comes to your singing I can find no wrong! Jamie and I were in the audience! The Audience wrangler who prompts the applause and sets the tone told us “you Cannot Have TOO MUCH ENERGY!” Later, a CBS Paige came and asked us to tone it down because we were blowing out their microphones! Hahahahaha! So precious ! The show was amazing and he sang GT twice because of sound issues. Awwwww. Twist my arm. Very lucky to have been there! The Original High. I did see a group of at least 15 other Glamberts there.